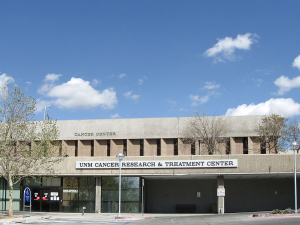 New Mexico's leading facility for cancer care and research, located on the North Campus of the University of New Mexico (UNM) in Albuquerque. This cutting edge and comprehensive center ranks among some of the elite cancer treatment and research institutions in the U.S. Since Hillerman's writing, it has been renamed the UNM Comprehensive Cancer Center. "UNM Cancer Research and Treatment Center, Albuquerque, NM April 17, 2010" by AllenS is licensed under Public Domain.